What is a Salmon Junky? ”You must have hooked many salmon, lost some and landed far more, before you can call yourself a “salmon angler – BUT the take from just one Salmon – has the power to hook you for life” ! That is what the famous Danish painter, writer and fly fisherman, Svend Saabye wrote in his masterpiece of a book “Angler’s life” and Svend really mastered to the essentials of salmon angling in these few words. 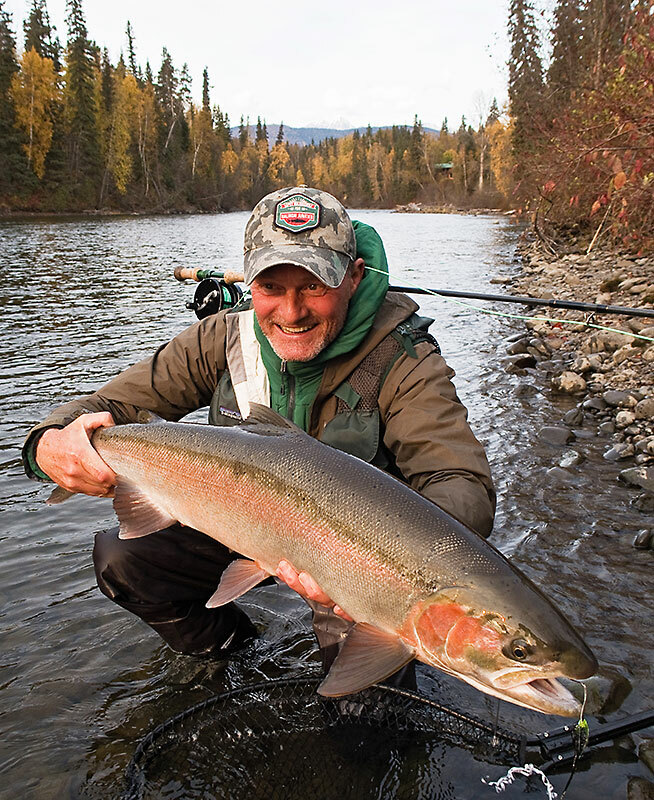 Many of todays anglers have very understandably lost their heart and soul to Steelhead fishing in British Columbia. Once fished one of these magnificent rivers, you get deeply hooked. It´s like to turning back the clock a hundred years, back to the time when our grandfathers were swinging a big wooden rod, over thousands of Salmon. Good Salmon fishing has always been an expensive game, but we at Salmon Junkies have tried hard to redefine the concept and profile of the game. We hope that you will browse through our web pages, in order to feed you dreams and fantasy – With Salmon Junkies you are just a short Spey cast away from the “Golden pool”, where the mighty Steelhead or Chinook can grab your little fly at any of its swimming seconds. Steffen Juhl (Born 1961) started to fish in the bathtub in his parent´s flooded basement just after he could walk – When he was 12 years old he took off on a new path and began fly-fishing. After a military career, Steffen was a fire fighter in Copenhagen for eighteen years. Beside Steffen’s job in Copenhagen, he was also working as a freelance writer and photographer for several magazines, and as a fly-fishing instructor for the Danish sport fishing association. Steffen started to travel in the former Soviet Union in the early nineties, fishing remote areas like the Kamatcka Peninsula in the Russian Far East. Steffen belong to the “First generation” of foreign anglers who came to Kola Peninsula in the early 90’s, where he was building up and managing, some of the world’s finest salmon camps on rivers like Umba, Kharlovka, Rynda, Yokanga and Ponoi. Another key issue for Steffen has always been a strong and friendly relationship to his many guests staying and passing through his fishing camps. Steffen lives in Sweden, when he is not in the bush somewhere swinging his dear Spey rod – A true Salmon Junky with a lifelong addiction!